Since 1973, the Dioceses of Honduras and Central Florida have been Companions in Faith, Partners in Mission. Together they have opened the eyes of tens of thousands of Hondurans to the love and power of Christ. In 1973, Honduras had four small Episcopal Churches and four priests struggling to serve people bound in poverty. There were too many men and women without hope, too many abandoned children, too many places that had not heard the Work of God for generations. Under the Rt. Rev. Lloyd Allen, the Diocese of Honduras now has more than 150 parishes and mission, and is working toward self-support. But our companion diocese still urgently needs our help. For that reason, our churches in Central Florida have designated their Thanksgiving offerings for the work of our Honduran campaneros en Christo. Our work with them has enriched lives. Each year our Thanksgiving offerings go toward this good work that has made Honduras one of the fastest growing dioceses in the Anglican Communion. To read more on the history of this vital mission and ministry between our dioceses please read the special CFE edition here. Read Bishop Brewer’s 2016 Thanksgiving Letter For Our Brothers And Sisters In Christ In Honduras. The 2013 Annual Thanksgiving Offering was designated for the completion of Cristo Rey, a large church in Danli and for the electrical work needed in two smaller churches in the El Pariaiso Deanery. The Diocese of Central Florida’s generous response to this year’s Thanksgiving Offering was close to $15,000, which will go a very long way in completing the work in these churches! 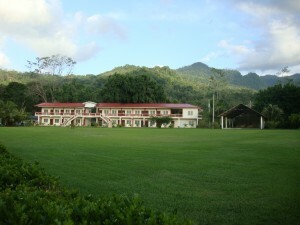 The 2011 Annual Thanksgiving Offering for Honduras was designated for the support and expansion of the Honduran Diocesan Conference Center located in La Santa Cruz. Bishop Lloyd Allen’s current goal and pressing need for the center is to air condition the dorm rooms and upgrade the bathrooms. Also in need are more adequate refrigerator and freezer storage. In addition to the upgrades those attending Cursillo, Happening and other diocesan events will appreciate, these improvements will further enhance the conference center’s ability to draw tourist, commercial and governmental groups and be a stronger source of diocesan income. Send checks to the Episcopal Diocese of Central Florida, 1017 E. Robinson, St., Orlando, FL 32801. Write “Honduras Offering” in the memo line. Click here and make donations online.